Old Hall Restaurant is a Persian influenced Restaurant based on Main Road in Dorrington. 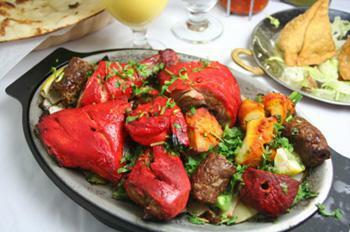 We serve a wide range of delicious Persian influenced food and offer table booking. Shrewsbury’s only Persian influenced restaurant is predominantly ‘Iranian’ and refers to the traditional and modern styles of cooking related to Iran, but originates from the Persian Empire which stretched right across the Middle Eastern region. Situated in the Middle East, the Iranian culinary style is unique to Iran, though has historically both influenced and has been influenced by Iran’s neighbouring regions at various stages throughout its history. Fresh green herbs are frequently used along with fruits such as plums, pomegranates, quince, prunes, apricots, and raisins. Typical Persian main dishes are combination of rice with meat, lamb, chicken, or fish and some onion, vegetables, nuts, and herbs. To achieve a balanced taste, characteristic Persian flavourings such as saffron, dried limes, cinnamon, and parsley are mixed delicately and used in some special dishes. While the eggplant (aubergine) is “the potato of Iran”, Iranians are fond of fresh green salads dressed with olive oil, lemon juice, salt and pepper, and a little garlic. Vegetables such as pumpkin, spinach, green beans, broad beans, courgettes, varieties of squashes and carrots are commonly used in rice and meat dishes. Tomatoes, cucumbers and scallions often accompany a meal. A small sweet variety of cucumber is popularly served as a fruit. The varieties of rice most valued in Persian cuisine are prized for their aroma, and grow in the north of Iran. Can only be used on www.oldhallrestaurant.com. Cannot be used in conjunction with any other offer. Top Nosh. A culinary fireworks show, from the superbly subtle to the hot and spicy. Dorrington Old Hall is no longer an Indian restaurant - it is PERSIAN! It is family run with excellent food more of a traditional family style than to appease the foodies. There is ample food on buffet nights, the food being the same as the alacarte menu, so you are able to pick and choose from a large array of dishes.